Although it is not nearly as elite an achievement as being inducted into The 500 Home Run Club, several of baseball’s greatest sluggers were chosen to grace the cover of America’s most prestigious news magazine - TIME. While Babe Ruth was the first member of the 500 Home Run Club, his TIME magazine cover story came decades later on April 26, 1976, with a cover story that reported on the grand opening of the newly remodeled Yankee’s stadium, and read: “In New York, hallowed old Yankee Stadium, the house that Ruth built, reopened in plushly refurbished form. It was 53 years from Babe to Abe, but the difference in what a community will lavish on its sports team could be measured in light years. It is basically the same looming, irregularly laid-out structure whose vast inner space Babe Ruth, Joe DiMaggio and Mickey Mantle roamed heroically. Only it is clean, shiny and for the first time comfortable. Mickey Mantle made the TIME cover on June 15, 1953 with a cover story that read in part “White Sox Pitcher Billy Pierce, a lefthander, stared moodily down the 60-ft. stretch between the mound and home plate and faced a special problem. At the plate stood a corn-haired youngster just four years out of an Oklahoma high school, with NEW YORK spelled out in block letters on his flannel shirt, a big numeral 7 on his back. As it must to all other clubs in the American League, came the plaguing question: What does a pitcher throw to Mickey Mantle of the New York Yankees? Reggie Jackson’s June 3, 1974 cover heralded him as a “One Man Wild Bunch,” and read in part “Rightfielder Jackson makes a habit of circus catches and bullet throws to the infield and home. Last October Jackson tormented the New York Mets in the World Series as he led the A's in hitting and spectacular outfield defense. For his efforts, he was named Most Valuable Player of the league and the series. The awards merely underscored what everyone in baseball already knew—Reginald Martinez Jackson is the best player on the best team in the sport. 500 Home Run Club® honoree Jackie Robinson’s September 22, 1947 entitled “Rookie of the Year” showed his smiling face on a field of baseballs, and read in part “He seems to hit a baseball on the dead run. Once in motion, he wobbles along, elbows flying, hips swaying, shoulders rocking—creating the illusion that he will fly to pieces with every stride. But once he gains momentum, his shoulders come to order and his feet skim along like flying fish. He is not only jackrabbit fast, but about one thought and two steps ahead of every base-runner in the business. He beats out bunts, stretches singles into doubles. 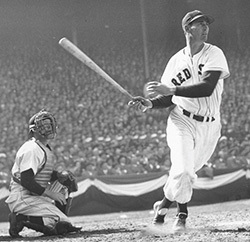 Once Jackie made second on a base-on-balls; he saw that the catcher had lost the ball, so he just kept on going. Mel Ott made TIME’s cover on July 02, 1945 with the cover story that read in part, “In 1941 Brooklyn won the pennant and the Giants got a new manager: Melvin Thomas Ott, the club's slugging right fielder with a peculiar but potent cocked-leg stand. The feud was and still is in flower, but hard as they tried, the Flatbush faithful could not hate stumpy, boyish Mel Ott. A soft spoken, brown-eyed little (5 ft. 9 in.) guy with a passive Southern accent and an active taste for Crayfish Bisque New Orleans style, Playing Manager Mel has long been a favorite of fans everywhere. More important than his batting records, he had something that made people like him. Willie Mays’ July 26, 1954 Cover Story was entitled “He Comes To Win” and read in part “At the plate, Willie stands, with comfortable authority, in the classic legs-astraddle pose (weight about equally divided between both legs, feet about a yard apart). His big bat (35 in., 34 oz.) is currently connecting for a hit one out of three times (a .331 clip). 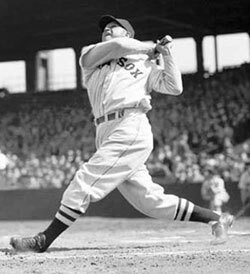 A "spray hitter," apt to send the ball to any field, he rarely tries to place his shots but swings for the fences. "When you tag 'em good," says Willie Mays, "they'll go over the roof in any park."